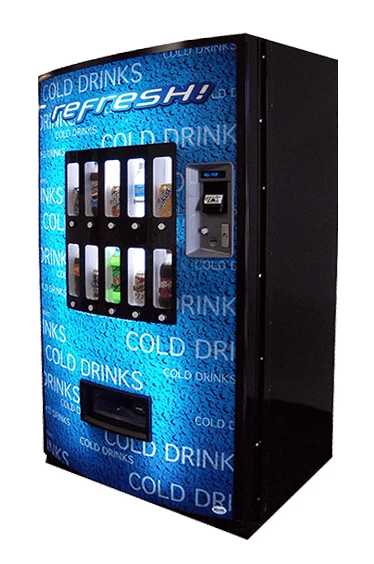 With the Vendo 721 Live Display Drink Machine or “Blue Refresh” you can vend 10 differently priced items ranging from 12oz cans to 24oz bottles. This Drink machine does not use flavor strips. You place the product in the display window in the door. No flavor strips to keep track of. Works well in a medium to large location. The Vendo 721 Live Display drink machine is attractive, and has a well lit product display with energy efficient led lighting for maximum customer appeal. The flexible shimless vending of bottles, cans, and cartons provides for an optimal product mix and maximum profit. The Vendo 721 Live Display refrigeration system provides superior cooling performance while using less energy. The Vendo 721 Live Display Drink Machine vends items from 12 oz cans – 24 oz bottles. No shims, no spacers, no gauge bars, no gauge bar clips, no cams to adjust on the Vendo 721 Live Display. The Vendo 721 Live Display vend mechanism has built-in anti-theft features. To compliment this machine a new AMS 39″ snack machine or a refurbished AP 113 snack machine would do well.